After 3 somewhat slow episodes ‘Necromancing The Stone’ was a wonderful breath of fresh air. Not one second of screen time was wasted. There were highs, there were lows, there were laughs & there were moments my eyes just wouldn’t stop watering. It was Legends of Tomorrow at its absolute finest. The episode opened with Sara having a very bad dream. It was obviously to foreshadow the events of the episode, but the writers were clever enough to allow it to serve a dual purpose as Sara woke next to Ava. That’s right the AvaLance ship is well and truly sailing at this point & it’s wonderful. I’ve been waiting for Sara’s hook-up with Constantine to be addressed for quite a few weeks now, and the show didn’t disappoint. Ava was playfully jealous, wondering who exactly this John was that Sara was talking about in her sleep, and Sara explained he’s basically the demon guru, a somewhat friend, and old acquaintance. No-one likes to hear about the person they’re dating’s past conquests. Ava was a little bit stunned by just how recent said conquest was, but Sara smoothed things over by pointing out it was 3 weeks before she had a girlfriend. Ava likes that Sara refers to her as her girlfriend, Sara likes referring to Ava as her girlfriend, and if it weren’t for Gideon interrupting them, well things would’ve gotten very interesting. But they are rudely interrupted as the anachronisms are getting bigger. Sara decides the best way to deal with them all is to tag team. Wally hilariously fetches Mick from his bed, where he was sleeping naked and Mick is a bit confused as to why exactly he’s wearing a gown. Wally explains he dressed him, Mick isn’t very impressed, Wally wishes he could unsee the things he’s seen, and this type of simple interaction is what I’ve desperately been waiting for on the Wally front. He’s not feeling like such an outsider anymore to the Legends, nor to us viewers, which makes it less awkward and funnier to have him on screen. Back to the anachronisms though and whilst Sara pairs the Legends up, she’s got a bit of a headache. That headache leads her to the death totem which is sitting nicely in a box on the ship. The totem calls out to her & Sara is confronted by her worst fears; herself. After the cut we’re straight into a scene of confusion and devastation. Mick is out cold, Ray has been badly beaten up, Gideon’s communications are all down, and the Legends are panicking. That’s ramped up even further when they discover Mallus has taken over Sara’s body. They attempt to fight the possessed Sara, but she well and truly kicks their bottoms. Ava checks in on Sara and after a moment realizes she’s possessed. With the Legends running low on options, Ava ever reluctantly seeks out John Constantine. He was after all the person who managed to bring Sara back the last time Mallus took her over, so it’s hoped he’ll be able to do the same again. I absolutely love John Constantine. He’s a marvellous character who fits in anywhere, thanks to his wonderful portrayer Matt Ryan. It was announced earlier this week Matt Ryan will be taking up a series regular position if the show’s renewed for a 4th season. I very much need that to happen. 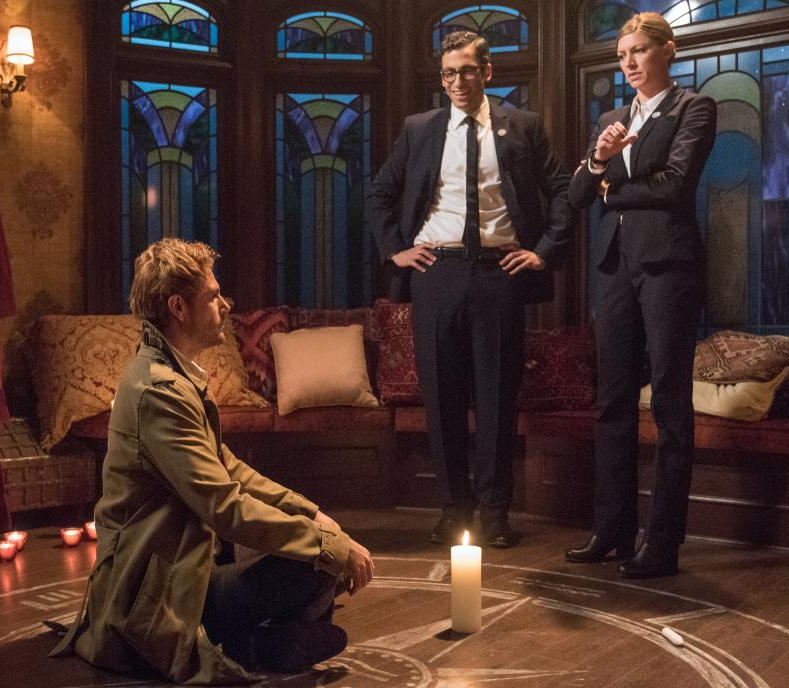 Because he’s Constantine, Ava and my second favourite Time Bureau Agent Garry track him down in New York, where he’s performing some type of ritual. He thinks they’re from the housing association and proclaims his rights, but Ava explains they’re actually there about Sara. Constantine doesn’t greet the news of her possession at all well, but calmly explains he ordered Ray to kill her if Mallus took her over again. Ava is very much not on board with this plan, and explains Sara is tied to the death totem. That’s news Constantine greets even worse, as he explains that the death totem sided with Mallus in the war of the tribes. All of this gets very technical but the basic gist is the death totem is extremely bad, and Mallus is ever closer to being freed. Having no choice, Constantine reluctantly agrees to go to the spirit world and get Sara back. Jealousy getting the better of her, Ava questions why exactly Constantine is the only one who can travel there. He explains he and Sara are tied to each other. Arrow viewers will know that tie came through Constantine resurrecting Sara back in season 4. Non Arrow viewers and Ava will think Constantine is referring to their hook-up, so she informs Constantine that she is also connected to Sara. Garry’s face throughout this whole exchange is an absolute delight. If you’ve ever heard of the phrase ‘Captain of the ship’ in relation to fandoms and couples on screen & in movies? I think it’s safe to say Garry is the captain of the AvaLance ship. He’s just so happy & gushing over their relationship, whilst Constantine is toying with Ava, who admits she’s jealous and trying to understand how Sara can hook-up with Constantine and weeks later get with her. Which to be fair, is a decent question. 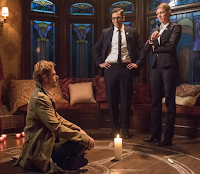 Constantine and Ava aren’t successful in travelling to the spirit world and instead, with inspiration from Garry’s ‘Dungeons and Dragons’ quest, decide to connect to the totem instead. That takes them to the Legends ship (Mallus has it sealed off so no-one can get in or out and Gideon is down) where Sara is beating the crap out of Nate. Yes, whilst Constantine and Ava have been going back and forth Sara has been bringing the Legends worst fears to life. Wally sees Jesse who informs him he was never good enough for her coming from the background he did. Zari sees a younger version of her brother who asks for help. Nate sees one of his ancestors, who laments all that he gave up and tells Nate he’ll never make Amaya happy. Ray throughout all of this is still unconscious, and Mick ever so slowly is persuaded by Amaya to step up and be the hero. 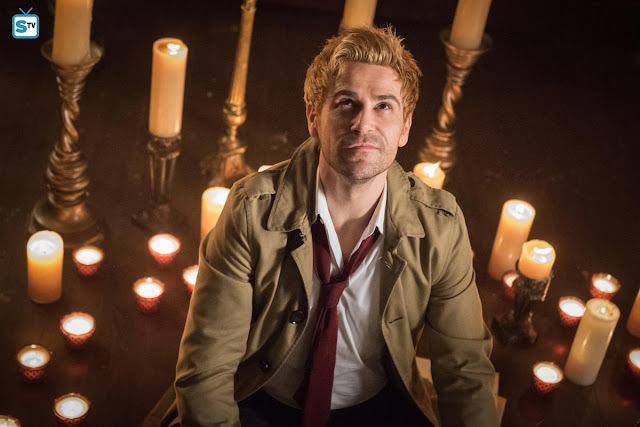 He manages to connect with the fire totem and stop Sara from killing Constantine, and knocks her out in the process. Ava rushes to her side once more and pleads for Sara to come back to her. In the spirit world Sara is being taken down a journey of memory lane into all the bad things she’s done, and Nora tries to persuade her to give in to the darkness and let Mallus set her free. Rejecting this and well aware of the pain being caused in the real world by Mallus, Sara is more than happy to accept the darkness in her and the pain & destruction in the world, because it’s better than not feeling at all. Nora isn’t very happy with her decision, but Sara is soon back in the real world & Mallus temporarily gone again. She shares a drink with Constantine who admits he would’ve easily swapped Sara for Aphra if he’d thought Mallus was telling the truth. Sara accepts this and the two have a heart to heart, with Constantine commenting that he does what he does alone because it’s easier but Sara doesn’t have to. There’s also a joke about getting him a bed on the ship, which is probably down to the amount of times they’ve turned to him for help & setting up Constantine’s arc next year if the show is renewed. It's not all happy days though as Sara breaks up with Ava. She admits that being with Ava is the happiest she’s ever been, but has darkness inside her, and doesn’t want to put Ava in danger. Ava is more than willing to accept Sara’s fault & help her battle the darkness, but Sara points out she can’t battle something that is part of her. At this point I am well and truly bawling, and that’s made even worse by Sara discovering a note Ava left in her bed. It reads along the lines of the spot being reserved for Sara’s girlfriend, and at this point I am completely gone. Their relationship drama is obviously setting up next weeks big episode. There’s a lot of speculation over whether Ava is an Artificial Intelligence Unit, Clone or Robot. The promo & pictures for the episode do not make it any clearer & The CW is very much playing its cards close to its chest. Personally, I would much rather Ava be a clone than robot or any other theory. I think she’s a great character, love her relationship with Sara and Jess Macallan’s twitter interactions are beyond hilarious. For that alone she should be getting a 4 season contract! During her time on Arrow, Sara was far from my favourite character due to how terribly she was written and how much I adored Laurel Lance. During her time on Legends of Tomorrow, Sara has grown into a pretty amazing character and she deserves some real happiness. If Ava turns out to be an AI or Robot? Everything between them has been fake, and you just know Sara would be battening down her hatches and never letting anyone in ever again. Making her a clone isn’t great either, but at least it’d mean that their relationship has been real and most importantly! Ava can stay on the show. I think it’s also worth noting this weeks episode was so enjoyable because there were no Darhk’s (Nora’s cameo doesn’t really count), Sara was at the forefront of the action and the likes of Nate & Ray were used sparingly. We also got a touch of character development for Mick, no Rip & of course the non awkward Wally. There are only 2 episodes to go until the season finale and I am not ready!